During a 1994 television program about former spymasters, Kondrashev met and began a close friendship with a former foe, ex–CIA officer Tennent H. “Pete” Bagley, whom the Russian asked to help write his memoirs. 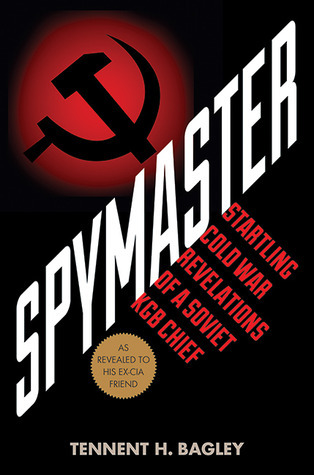 Because Bagley knew so about much of Kondrashev’s career (they had been on opposite sides in several operations), his penetrating questions and insights reveal slices of never-revealed espionage history that rival anything found in the pages of Ian Fleming, Len Deighton, or John le Carré: chilling tales of surviving Stalin’s purges while superiors and colleagues did not, of plotting to reveal the Berlin Tunnel, of quelling the Hungarian Revolution and “Prague Spring” independence movements, and of assisting in arranging the final disposition of the corpses of Adolf Hitler and Eva Braun. Kondrashev also details equally fascinating KGB propaganda and disinformation efforts that shaped Western attitudes throughout the Cold War. So, non-fiction isn't exactly completely this blog's wheelhouse, but sometimes I get on a non-fiction kick, and this is what comes off of the bookshelf. I picked this one up when I was at the International Spy Museum in Washington, D.C. recently, although I'd also seen it around on the internet when googling for "books about spies during the Cold War", as a person such as myself may be likely to do. That said, this book is a fascinating look behind the curtain at how the KGB worked, and just what lengths they went to in order to fulfill their mission. The very way that this book came to be written is amazing. Bagley and Kondrashev struck up the most unlikely of friendships after the Cold War was over, which turned into Bagley helping Kondrashev write his memoirs -- which were, of course, quashed by the present-day Russian government as revealing too much. Some of my favorite moments in the book were ones where Bagley finds out the flip side to a case that he'd worked for the CIA. I can only imagine being in this position, years later, to find out from someone very close to the top that maybe you were right, or maybe you were on the right track, or that maybe there was more to the story than you'd ever imagined. This isn't the type of book you can just go in and read cold -- it presumes you have some knowledge of the major events of the Cold War, so if you're not a history buff, you might be a bit lost. But if you're into this kind of stuff -- A) we should totally be friends, and B) you will probably dig this book. There are plenty of references and footnotes to other books, too, if you're interested in continuing to broaden your horizons.